My fellow Milenomics, today we come together not to reflect on years past, but to look forward towards the future. I’m here today not to explain away or excuse the current state of affairs, but to add clarity to the world of travel with points and miles. Earning miles has become easier than ever, yet travel with miles has become more difficult than ever. There are ever more people with ever larger mileage balances fighting for fewer award seats. Some of you say “the best years are behind us,” and “the golden age is over.” While I agree that some deals have died, others are still running strong. And new ideas and processes turn up weekly. Our ingenuity as a group is second to none. We’ve crippled corporations big and small, using them to earn our miles and cashback. I continue to firmly believe in the ability of easy, cheap credit to further our mile manufacturing for years to come. Our domestic airlines are in a 2 year period of flux, moving from the established 1 mile flown = 1 mile earned to a new, incredibly confusing earning structure. However, as Milenomics, we should insulate and exempt ourselves from these changes. Whenever possible we should default to using our miles for travel, reducing balances as much as possible before spending our hard earned cash. As actual paid flyers earn less miles we should see an easing of competition for award seats in the long term. I’d like to take a moment to go over our domestic allies, and where they fit into my mileage conservation strategy. American Airlines: The state of American Airlines is suspect. The tract record of new management, and the issuance of Billions of miles means something big [and bad] is coming. The AA empire has flooded the market with cheap miles—use them now, or be beholden to future devaluations and increased fees. United: The state of United is Divided. Over the past year United has shown it to be a “me too” airline. One which cannot come up with original ideas, and does not know who they are. That said, earning United miles is still incredibly easy, and their award availabity can be some of the best around. Delta: The state of Delta is STRONG. Gone are the days of fighting the delta search engine for hours. When dealing with an axis of evil member like Delta, always assume you’re being ripped off until you verify that you are indeed being correctly charged for your flights. But with a new search engine, one way awards, and extremly cheap costs to manufacture skymiles, Delta is going to be a surprising winner of a lot of award travel in 2015. Our Foreign Allies are not immune to the devaluations we’ve seen from our domestic carriers. April will see major changes to our Japanese ally. We need to support these foreign allies whenever it best benefits us. Make sure to book anything you need before these programs change, using your Demand Schedule for future flights. Just this week, our British friends, long standing partners in the fight against paying for short and medium haul domestic flights, announced changes. While the changes will hurt some of us, the silver lining is that those changes don’t affect domestic coach flyers. The devaluation of programs reminds me to caution us all–just because Miles and points are great for some people doesn’t mean they’re great to collect for all people. For those of you whose travel pattern or lifestyle don’t lend themselves directly to earning miles, fear not, There are plenty of opportunities to earn cash back, and buy tickets with fixed value points. Cautious Optimism—More now than ever we need to be well educated to the game we play. The layers of complexity are ever increasing, and the ability for the airlines to fleece us out of unnecessary miles and money abound. We must be vigilant, and learn as much as we can about using the right tool for the job. Fuel Surcharges- I will actively fight against the scam that is the “fuel surcharge,” And I ask you today to join me in doing so as well. Never book a fuel surcharge heavy ticket without checking all possible options first. We should also publicly shame any airline imposing these cash grabs against us, their dedicated flyers. Shame on you for passing on made up fees and eroding the value of our hard earned miles. An empty account is nothing to fear! It means two things: It is ready to be refilled and also that you used those miles for wonderful memories. 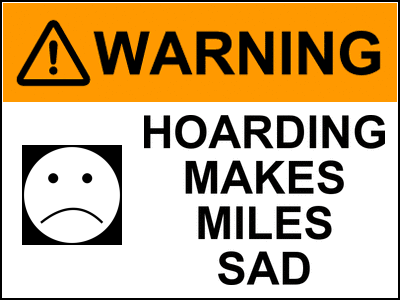 Hoarding- The scourge of our time continues to be a problem. Every week I hear a tale of hoarding gone wrong. Take Mary from Indiana. She wrote me asking what to do about her mileage balances for a trip to Hawaii. Mary worked hard at applying for any and all credit cards she could receive. She had 30,000 to 60,000 orphaned miles in programs from Hawaiian airlines to Lufthansa. To top it all off Mary had a whopping 600,000 BA Avios yet still wanted to know what cards she should apply for in order to travel to Hawaii. My Fellow Milenomics, more miles is not always the answer. Mile Hawks will tell you that we need to be aggressive, and root out any and all miles we can right now. I’m here today to outline an alternative plan: One in which you attempt to draw down all your mileage balances to as low as possible, and balance your earning with your usage of miles. Place your money in a “lock box” and don’t touch it until your miles are all used up. No longer will we be caught holding hundreds of thousands of miles only be surprised when the enemy devalues our currencies overnight. If you’re looking to always fly first class more power to you. There certainly are great ways to do so for less, and we’ve outline them here in the past. It is incredibly important that we have a frank discussion of the costs associated in doing so. Remember, travel is not free. If you’re a family of Four making your miles slow and steady and booking coach trips I want to make sure that you don’t waste a single precious mile if you don’t have to. Which is why, today, I’m announcing a plan to help anyone who needs it with booking awards. Just drop me a line and we’ll come up with ideas together. Because the strength of a nation is not in how the loftiest are treated, but in how the nation as a whole is lifted up. Today I ask us to all be a little more brave. I ask us to build each other up, not tear each other down. I ask you to fight against the enemies who try to take value from our miles as we sleep at night. Let’s Dare to fly, and let’s lift each other to the sky. Thank you my Fellow Milenomics. God bless you, and God Bless our mileage balances. Bravo – Now that’s a speech I’d clap for. I don’t necessarily agree 100% with it, but well thought out, and especially well done! BRAVO, Bravo, Bravo, you are back and better then ever. who is the very tan guy sitting behind you? Loud applause filled airports round the world tonight, as Milenomics from more than 80 countries cheered a very strong speech by the President of Miles and Points. great post!!! This made my Saturday morning, love it. Thank you for taking your time to post. Excellent read for my Saturday morning. Elaine’s quotes of your speech is spot on! Disagree on most things. Especially the notion that MSing is easier than ever. That’s an utterly laughable and demonstrably false statement. As for Delta being a great program due to low cost miles, that’s another laugh since Suntrust has only been available to a small geographic area for at least two years. It remains a mediocre program for everyone else (especially the poor schmucks who previously enjoyed cheap paid flights and earned tons of miles). The only reason it’s mediocre is almost every other program has devalued significantly, so it’s rising up against the competition from the dismal last place it had been in. That’s faint praise…(soft slow clap). As for earning and burning, I disagree. No worse feeling than having a tiny amount of miles and get caught trying to book a flight and have the goal post moved. It’s much different when you have millions (earned at negative net cost) – the devaluations have little to no effect. I just roll my eyes when I read all the teeth gnashing and handwringing when there’s a devaluation. Get over it. It’s gonna happen. The way around these devaluations is to brute strength your MS. More is better. Faster is better. Big balances are better. The beauty of big balances is you have wide range of options – finding seats is far more problematic for me than finding the miles, and it’s a chronic problem for most people. Having choice to book seats thru multiple options has been critical for my international travel in the last year, especially when I want to make large itinerary changes on different carriers. The Golden Age of MS was April 2013 midway thru 2014. Then things started to die as the Evil Corporations began reacting to the advent of pins. They’ve been closing loopholes and programs ever since, at an ever-faster pace. Amex eliminated card churning or had large wholesale card closures on things like OBC. There were multiple devaluations (DL devalued twice or three times without notice). WM cracked down and in many places all but stopped accepting vgc – most kiosks are broken and/or have their MO disabled. VRs are dead. GoBank/MVD and a slew of other prepaids quickly died. AP is dead. PP has been neutered. Some groceries are placing daily limits on card purchases (supposed to happen in the next few days at Krogers). Simon stopped allowing >$10K personal orders, and raised prices. Atira/Coopera just died a few days ago. USB Buxx stopped accepting new applications. The list goes on and on and on and on…. Great stuff! We’re going places, whether or not naysayers decide to adapt and keep moving. As more and more earning and burning opportunities become location-specific, one size fits less and less people. A very informative speech & well done. Elaine’s quote of your speech is perfect!